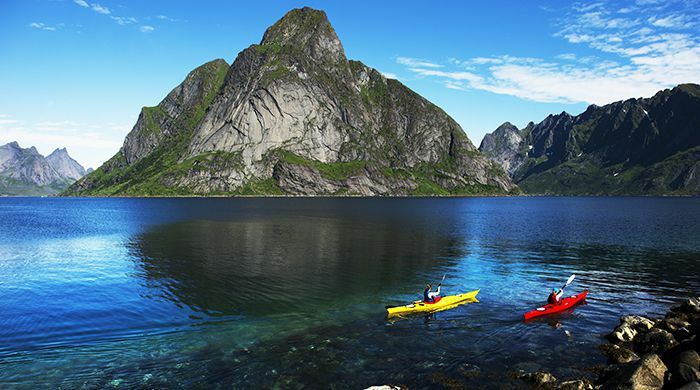 Kayaking, Reine, Lofoten, Mattias Fredrikson Photography. 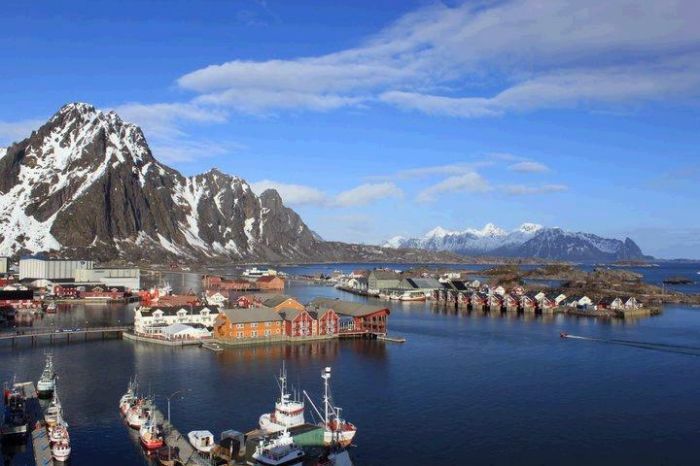 By any criteria, the Lofoten Islands are a natural wonder: an Arctic landscape of soaring mountains, deep blue fjords and long, surf-swept beaches. 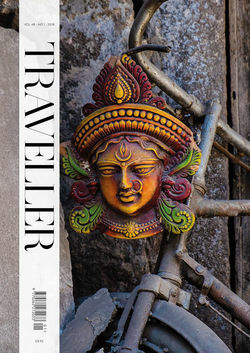 It's all showcased on this beautiful road trip, which pauses at centuries-old villages for stays in traditional rorbu cabins. Here, you'll be treated to included half-board dining informed by fresh, local products. 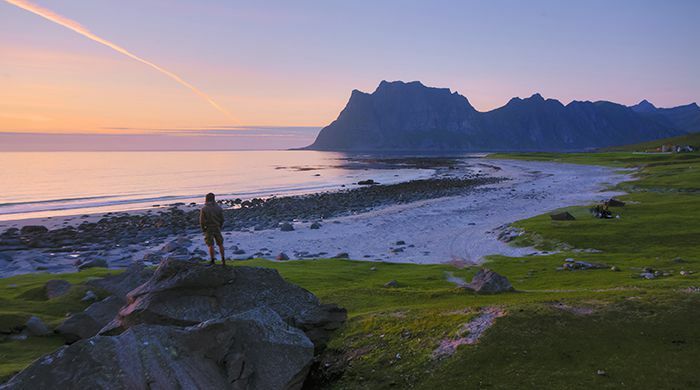 It's all made that bit more beautiful by the long summer days and the nightly appearance of the Midnight Sun, which casts an ever-present glow across this steep island-world. 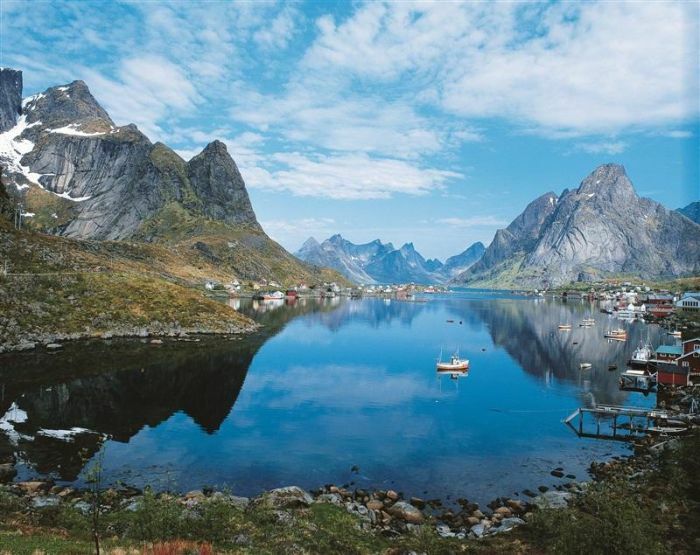 After enjoying your complimentary airport-lounge access, fly out to Bodø – the mainland gateway to the Lofoten Islands. 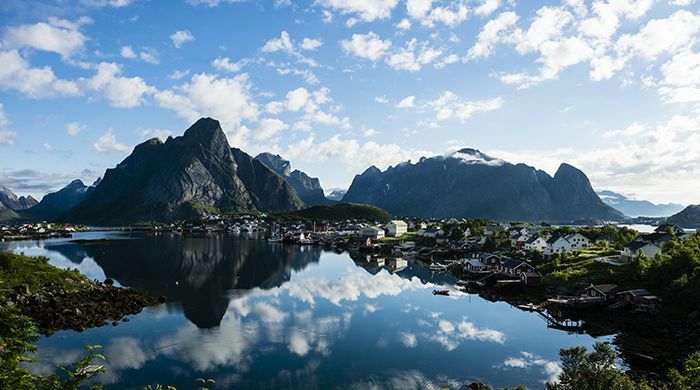 Here, you'll stay in Norway's tallest building, enjoying sweeping views of the coast and mountains from its elegant rooms and penthouse bar. Nearby attractions include the National Norwegian Aviation Museum and the Stone Age Museum, while the world's strongest whirlpool, Slatstraumen, is within easy reach. Having lived in Bodø for several years, it was Edgar Allan Poe's inspiration for his seminal work – Descent into the Maelstrom. 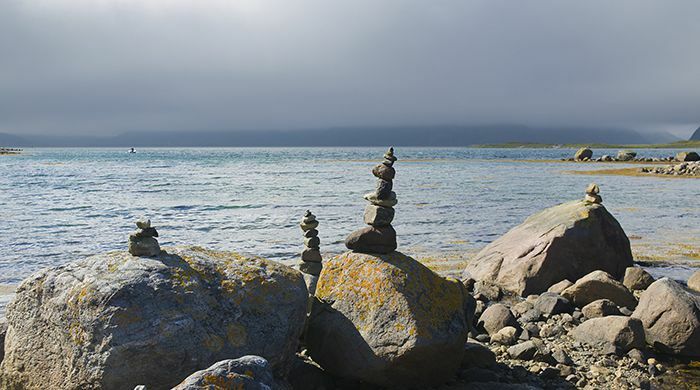 Flying to Leknes in the Lofoten Islands, you'll collect your hire car and make the short drive to Nusfjord, mapping coastal crags and hopping between islands to arrive at your traditional rorbu accommodation. 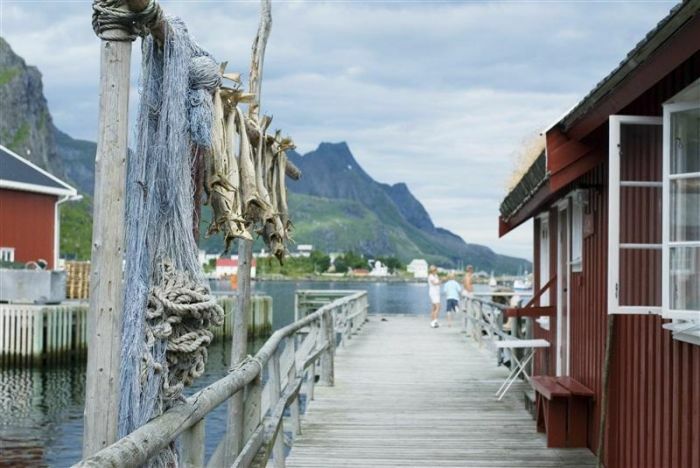 Your home for the next two days is a red-painted fisherman's cabin positioned right on the edge of the fjord, where you'll be treated to delightful local dining for both breakfast and dinner. Be sure to make use of the complimentary rowing boats, or explore further by hiking, biking and climbing in the surrounding mountains. 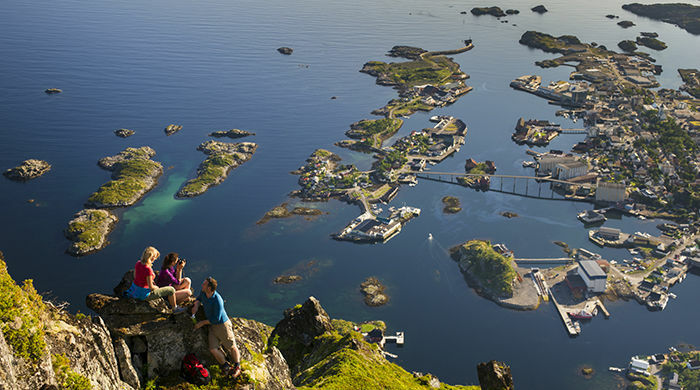 Alternatively, charter a fisher boat before driving to the jagged southern tip of the island – Moskenesøya. 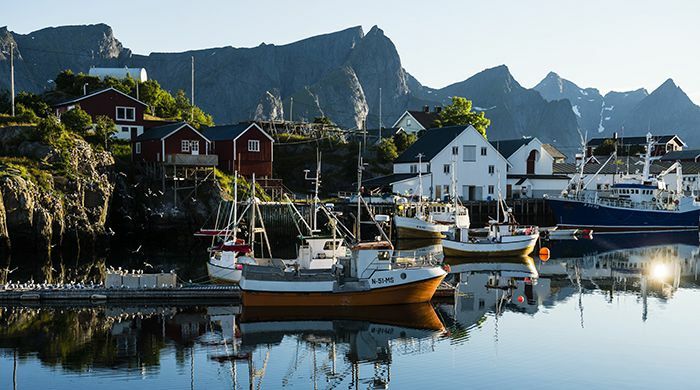 Your final ultra-scenic road trip will see you drive to the harbour town of Svolvær, the Lofotens' capital, and check in to your next rorbu. All options are a delight of timber-panelled charm, and most come with pretty fjord and mountain views. 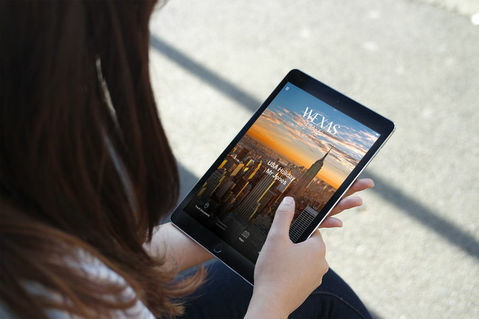 With two days free, you'll have plenty of time to relax and explore. After unwinding in one of the cute cafés and checking out the local art galleries, head out on one of the criss-crossing hiking trails. You'll soon be able to see right over the islands and on to the Norwegian mainland. 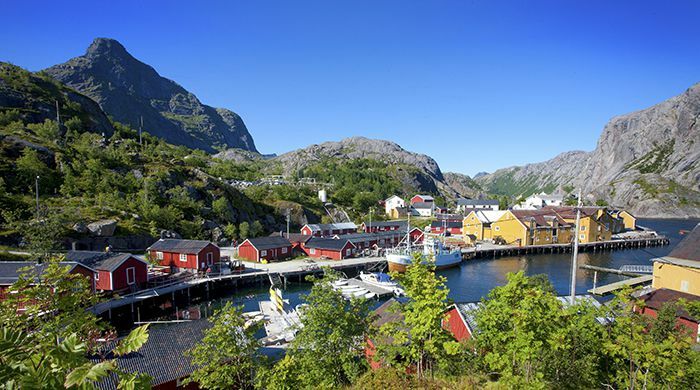 There's also the chance for a day trip out to the charming fishing village of Henningsvær, plunging through the archipelago's mountainous hinterland and stopping en route at the Lofotr Viking Museum at Borg. Built on the site of an original Iron Age chiefdom, the museum includes a reconstruction of the largest Viking-era building ever found in Europe.